↑ 12.0 12.1 Woese C, Kandler O, Wheelis M (1990). 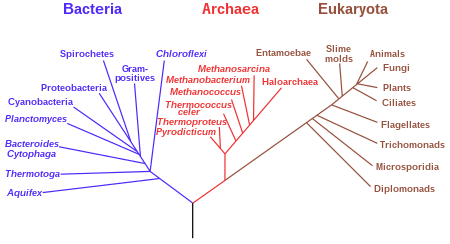 "Towards a natural system of organisms: proposal for the domains Archaea, Bacteria, and Eucarya". Proc Natl Acad Sci USA 87 (12): 4576–9. Bibcode 1990PNAS...87.4576W. doi:10.1073/pnas.87.12.4576. . PMID 2112744. http://www.pnas.org/cgi/reprint/87/12/4576. Huling pagbabago: 11:37, 15 Abril 2018.